Before you get started this recipe assumes you have what I had when making homemade yogurt. These are One quart of whole milk, at least a half cup of Greek-style plain “full fat” yogurt (homemade or store-bought), an oven with a “Bread Proof” setting, and a clean white pillowcase. Sounds interesting so far, right? When my folks were first married, and starting out in life on a limited budget as some newlyweds are, a lot of what they ate and made were “homemade” or from scratch. 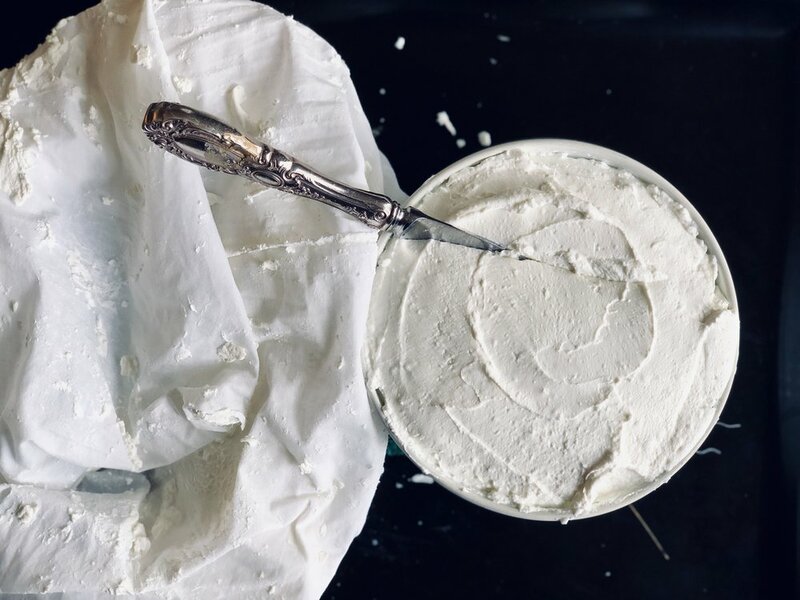 Yogurt is a staple in Persian cuisine, my mother recalls my father’s yogurt pillow case, full of homemade yogurt, tied to their kitchen faucet, “dripping” all night long. The pillowcase and the drip. Streptococcus thermophilus and Lactobacillus bulgaricus. The half cup portions that you introduce to your milk for this recipe has those bacteria required in them. You may also purchase “yogurt starters” that will have the necessary bacteria in them as well. Follow the directions for that when making yogurt. Now for the science part of all of this, these critters start gobbling up the milk sugars (lactose) in their warm environment. Which in turn starts producing lactic acid. The lactic acid starts curdling the milk protein and also gives the yogurt that nice tart flavoring. For the bacteria to survive and do all this eating and “producing” you have to keep them in a pleasant warm environment. That's why the steady and constant temperature of 100-115 degrees is needed. When you go above that, you essentially kill the bacteria and have nothing but hot, sour milk. With all the various kinds, styles, and flavors of yogurt, making your own doesn’t seem that necessary… and is much less consuming…Not to mention your savings on home bed linen. 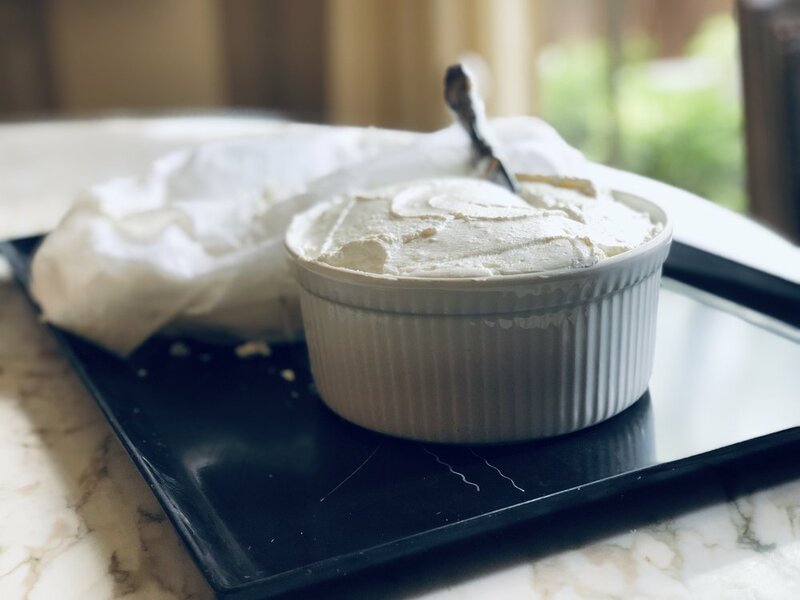 But, when you’re feeling your kitchen authenticity, or like a “bread starter,” you go from one batch to the other, making homemade yogurt can be quite satisfying. Basically, I have no legit argument for making your own yogurt. If you go through enough yogurt in your household, if you enjoy new kitchen challenges, then make your own. If not, yogurt shop to your heart’s desire. 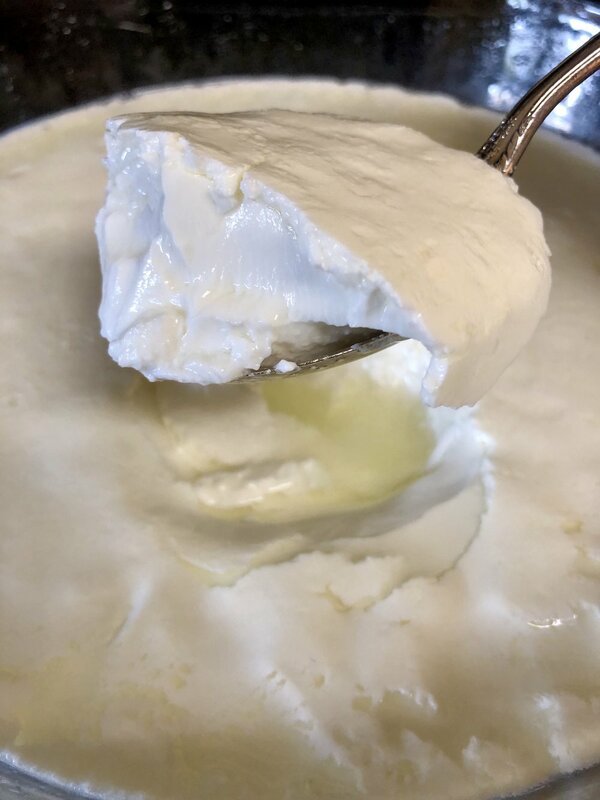 12-15 hours later, beautiful curd! If your oven has a “Bread Proof” setting, this is the setting that allows bread proofing to happen in your oven and reaches the temperature of 100 degrees Fahrenheit, then bully for you! If not and you have a Yogurt Incubator, or somewhere in your home with a constant temperature zone of 100-115 degrees, then use that source. We’re growing bacteria here, folks. So activate the Proof setting in your oven. In a large sauce pot add the cold milk and begin to heat slowly. DO NOT BOIL, just gently heat the milk until steam begins to rise from the top. Stir regularly so that a “skin” does not form or the milk does not scorch on the bottom of the pot. Pour the scalded milk into a clean nonmetal bowl and allow to cool to 100-105 degrees… just right above body temp. So, slightly warmer than your own body temp. Stir in the 1/2 cup of yogurt; do not whisk or mix in aggressively… just gently stir in with a spoon. Cover the top of the bowl with plastic wrap and place in the oven for 12-15 hours. After 12-15 hours remove from the oven. Spoon the yogurt into a CLEAN pillowcase. Bunch up the top and tie with roasting twine. Hang the pillowcase above a bowl to catch the whey/water that drips from the pillowcase. Allow for dripping 1-3 hours depending on how thick you enjoy the yogurt. Place the finished yogurt into an airtight nonmetal container and store in the fridge up to one week. Sweeten with honey and add fruit, vanilla, almond flavoring or cinnamon. Great with fresh fruit as well. For a more savory option make your own cucumber mint yogurt! Use the last 1/2 cup of yogurt to make a fresh batch if desired. A Sunday Dinner triumph! If you have been following me all these years, you know by now Sunday suppers at my house are usually Persian meals. 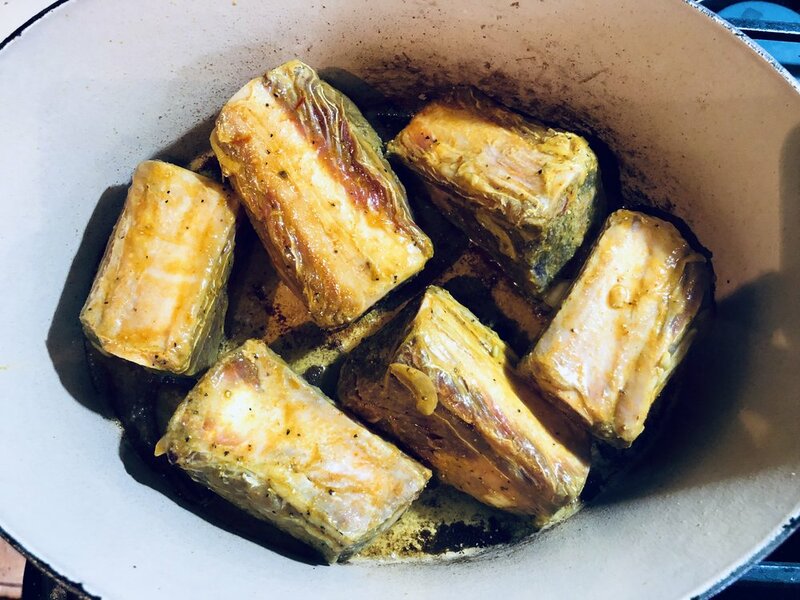 My original plan for tonight’s dinner was a dish that we grew up on affectionately called “Mushy Beans and Rice.” Pressure cooked short ribs and white beans until tender, then mashed together with cinnamon and turmeric, and served with Persian dill rice. I have no idea what the real name is, or if it’s just something my father made up. Whatever the proper name for the dish is, is of no concern… my family calls it Mushy Beans and Rice and that’s okay! The turn in the road for tonight’s dinner came when I was cleaning out my cupboard and noticed I had a large jar of unsweetened Pomegranate juice that was needing to be used soon. I had also seen earlier this week there were leftover walnuts in my freezer from Baklava night earlier in the month and a couple of lemons in my fruit bowl hanging on for dear life. So my mind began to scan ideas and what I came up with was something delicious. If I say so myself (and I do). 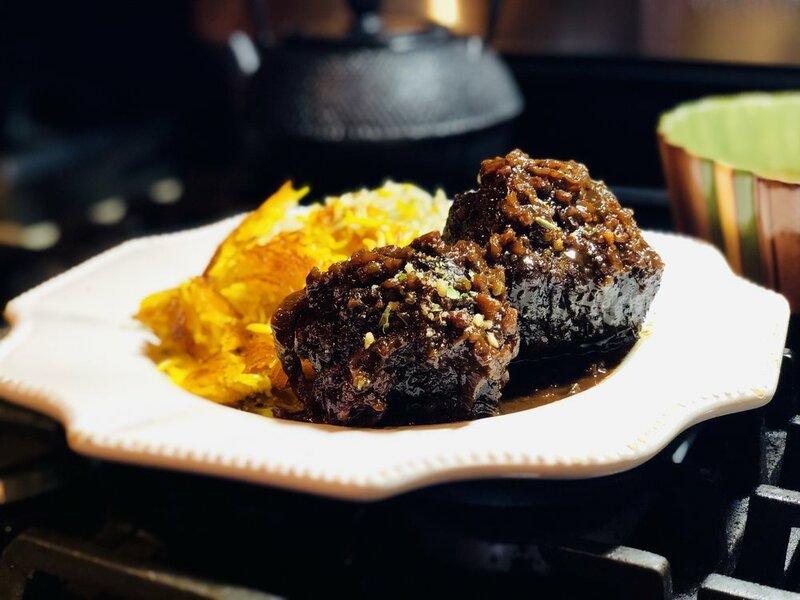 Now I can’t be the only one that has thought about braising beef short ribs in pomegranate and walnut, but the idea has Persian bells and whistles all over. In Persian cuisine, we have a stew of chicken or duck in pomegranate and walnut called Fesenjan. There is also a kabob dish called Kabob Torsh (Sour Kabob) using pomegranate and walnut… so what the hell? I’ll make a dish utilizing these short ribs and these ingredients! Trim off any excess fat from the short ribs, and pat dry. Place the ribs into a large nonmetal mixing bowl or dish. Add the sliced onion. In a small bowl combine all the spices, along with the Cook’s Line Seasoning (or salt and pepper), the oil, and fresh lemon juice. Mix all together and pour over the short ribs. With your clean hands ( or large spoon) toss the ribs, onion, and marinade together. Add the saffron water and toss again. Cover and refrigerate 1 hour to overnight. *Saffron Water: Persian kitchens always has saffron water at the ready to flavor most Persian recipes. To make: use equal amounts of Persian Saffron and Sugar. Grind them together with a mortar & pestle or do what I do my pinching and grinding between my fingers. Boil water and cover the saffron mixture with the water. You need about 1 tablespoon of water to 1/4 teaspoon of saffron. Let the mixture steep uncovered. Once cooled, cover and place in the fridge until needed. 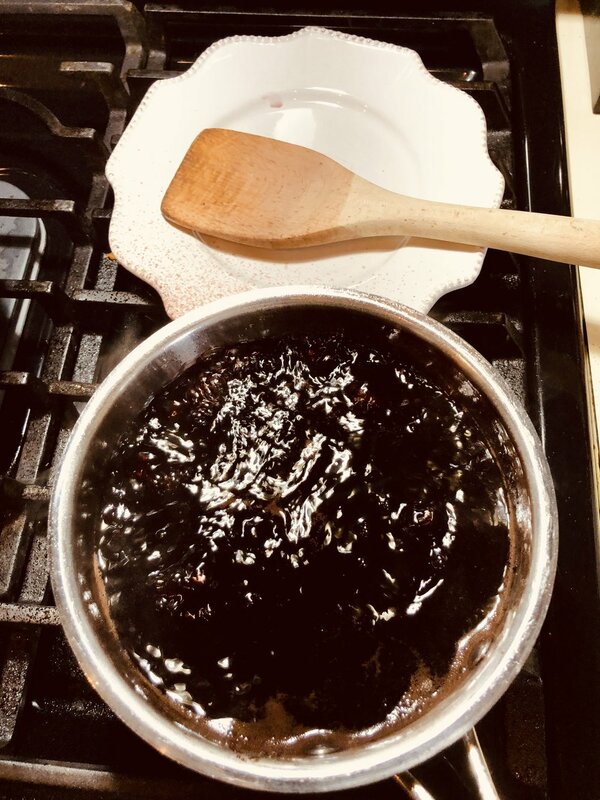 If you have made my Pomegranate Molasses recipe, then you will recognize this as being the same. The only difference is that we are not reducing the juice to a syrup. For this recipe you only want to reduce the juice by half, because this will be our braising liquid for the short ribs. Reducing the pomegranate juice, sugar, and lemon juice. Place the ingredients into a large saucepan and begin to heat. Stir the mixture until the sugar dissolves. Bring the mixture to a boil then down to a low simmer. Reduce the Pom juice to half the original amount. Remove from the heat. Preheat your oven to 325 degrees. On the stove top, begin heating a large dutch oven or heavy bottom pan safe for the oven. Add the one tablespoon of oil to the bottom of the pan and spread thin. We won't need much because there is oil in the marinade. Heat until the oil shimmers. Add the marinated short ribs one at a time to the pan “meat side down”; The bone side should be up. Brown all sides of the short ribs until a nice crust forms. Remove the browned ribs and pour out any excess oil. To the pan add the sliced onions from the marinade. Drain off as much of the marinade from the onions as possible. Sauté the onions until golden, tender, and fragrant. Place the short ribs on top of the onions, bone side down. Pour in the pomegranate juice reduction around the ribs. Sprinkle in the ground walnuts on top and all over the short ribs along with the saffron water. Cover the pan and place into the preheated oven. Bake for 2 hours. Remove the lid and bake an additional 30 minutes or until the ribs are for tender. Total cooking time approximately 2 1/2 hours. Remove the short ribs from the oven, and then the short ribs from the pan. It's okay if the rib bones fall off… it just means the ribs are tender. Discard the bones. Arrange the short ribs into an attractive serving dish or platter and cover to keep warm. Pour out the braising liquid into a large liquid measuring cup or pitcher. The excess fat will rise to the top after 10 minutes or so. Skim off the excess fat… do not stir! Pour the braising liquid into a small sauce pan and gently simmer for 10 minutes. Pour the pomegranate-walnut sauce over the short ribs. Sprinkle on minced parsley for added color. Serve with Persian Rice, Potatoes, or Egg Noodles. Enjoy! Sauce de-fatted, re-heated, and ready to roll! I served mine with Persian Dill Rice, but you can serve your with potatoes or even egg noodles! 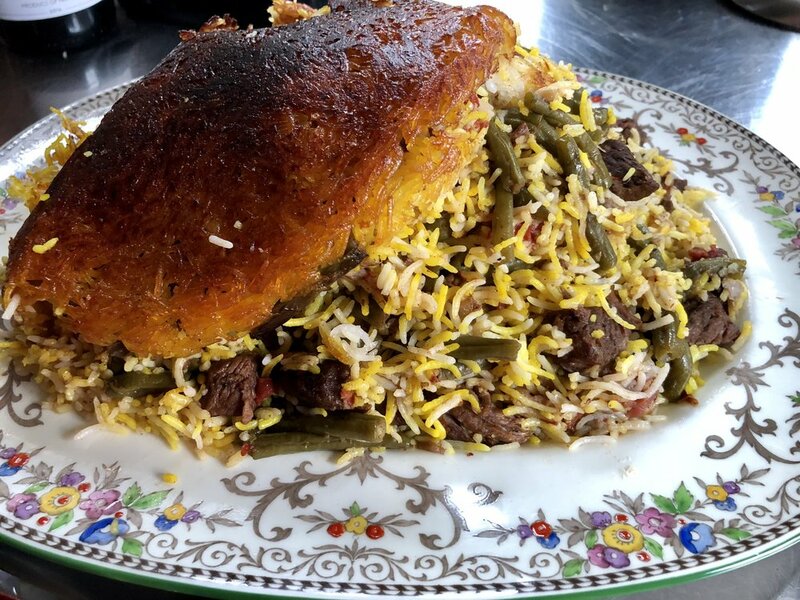 Loobia Pollo is a wonderful Persian rice dish made with Green Beans (Loobia) and Rice (Pollo) that I absolutely adore and that has a special memory for me. The story of how I was introduced to this dish when I was 8 years old and visiting Teheran with my family is a good one. It involves one of my most dearest Aunts, my Ameh (aunt) Manijeh. For the full story, you will have to read about it in my book.. where this recipe will also be included. So a couple of things: If you are new to Persian Cooking, the recipe may seem like a lot. Persian food, for the most part, isn’t something you can rush or take “shortcuts. We make a lot of stew and rice recipes and that means "SLOW AND LOW" cooking. Id shortcuts are taken you will most definitely tell in the quality of your dish. Your take away.. plan ahead and prep ahead! I believe in you! The Advieh, a Persian spice blend, is easy to make and you can find most ingredients in your grocery store. For the rose petal that is in the advieh, I recommend ordering EDIBLE rose online or your local Mediterranean market. The rice and "Goods" are layered, a drizzle (or three ) of the saffron water has been added, now ready for the final cooking. In a high sided sauté pan add a good sized glug of olive oil and begin to heat. Add the diced onion and cook gently until lightly golden and caramelized. Add the chopped garlic and season to taste with Cook’s Line Seasoning or salt and black pepper. Turn the heat up in the pan and add the cubed beef. Add 1 tablespoon of the Advieh spice and brown the meat. While this is going, in a medium to large dutch oven or stew put add a little olive oil to the bottom and begin to heat. When hot add the cut green beans and cook long enough to brighten the color and gently sear the outside of the beans. Add the beef and onion mixture to the green beans. Rinse out the beef and onion pan with water, making a mock “deglaze”, and add that water to the beef and green bean pot. You will need at least 3 cups worth or enough to cover the stew. Add the two cans of drained whole peeled tomatoes to the pot. And gently mix everything together while heating. Next, add the last tablespoon of Advieh spice and the fresh lemon juice. Stir the stew together and gently simmer on low to medium heat for 1 hour or until the meat is tender. Thirty minutes into the cooking of the stew, start working on your rice. The idea is to layer par cooked basmati rice along with the stew for a fine cooking process. Wash your rice in cold water at least three times until the water is clear. Wash and drain until so. I like to soak my rice first, at least 30 minutes because this quickens the cooking process and also creates a longer basmati rice grain when cooked. Pour the rice and water into a pot. You will need enough water to cover the rice, about 2 inches above the rice. Add a good pinch of salt and bring the rice to a boil. Cook the rice just until the center is a bit underdone, like al dente pasta. Pour the rice out through a colander in the sink, shake off any excess water into the sink, and return the rice pot back to the stove. Sprinkle a tablespoon or two of the saffron water over the top of each rice and stew layer. Complete at least 2-3 layers using up the rice and stew “good”. Reserve the stew “jus” for service. Cover the rice pot and cook on medium-low heat for 40-45 minutes. Too high of heat and you will burn the bottom. 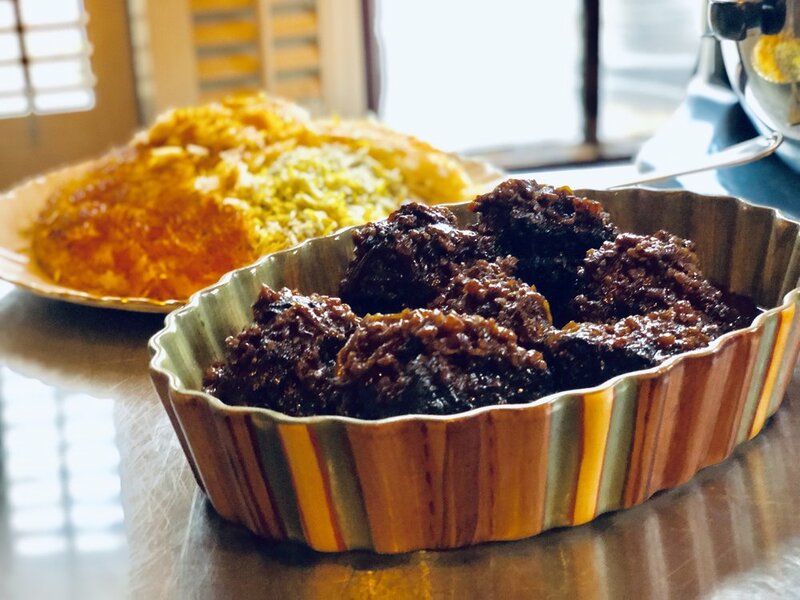 Just the right amount of heat and you will create the flavorful crusty delight every Persian loves…Tah’Dig! Tah’Dig means “bottom of the pot” and it is the crispy fried rice served along with the meal or offered first to guests. So when this is all cooked and everything has steamed together, crispy rice on the bottom, the steel is driving you crazy, remove the lid from the pot and turn off the heat. Gently mix the rice and stew layers together and spoon out onto a large platter. Pile the Loobia Pollo into a mound. If you have crispy Tah’dig on the bottom, remove it in one piece the best you can (pieces are okay too) and lay on the top of the orc mound. Reheat the stewing liquid to a boil and pour off into a sauce boat. Extra sauce over the top of the rice is quite nice! Serve the Loobia Pollo family style with Mast (yogurt salads) or pickled vegetables. Enjoy!